Instead of how it is currently, see attached. I fail to see how it would make a difference. Is the pipe in his picture threaded? usually the vertical stack does not line up with the sink because the stack fits better in X location and the sink fits better in Y location. You also don't want a horizontal run outside the wall because it will impede on vanity placement just be stupid to do when you have a wall open. I'm not a plumber, but I'm close, I'm giving it an 80% chance it's fine and that the person who told you that has just never seen it done that way. ohh, talking about the horizontal run. I've heard of a max length for that, but never a minimum. I'd think ideally you'd want it how you have it to save on pipe (makes a difference in high rise residential but not here), but that probably doesn't happen often like sflkgjsfndgn said. That's the vent, so it doesn't really matter. I was thinking the same thing, he's never seen it that way. I found similar pics online searching "sink plumbing sanitary tee". Read the trap arm has to be min length of 2d, so 3" in my case. Should be easily achievable before the p-trap. This weekend I being soldering supply lines. soldering? 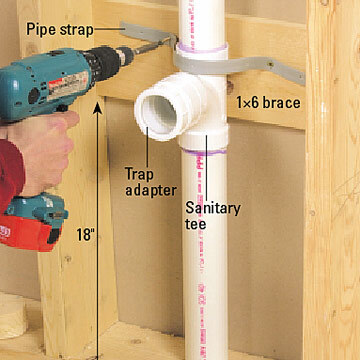 Pex it, copper is just a waste of time and money. 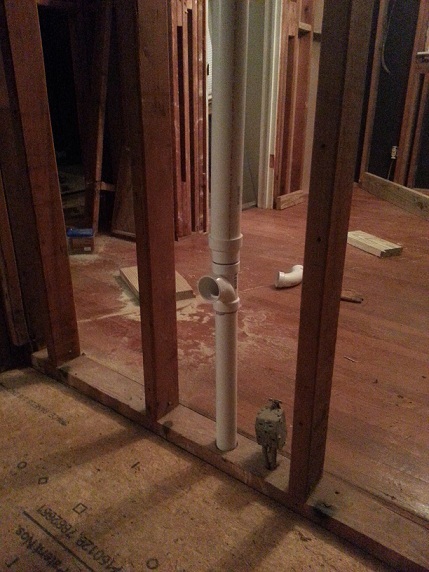 Not sure what you're tapping into, but if it's for a bath sink and you don't have low pressure, run 3/8th's pex back to the water heater for the hot. Hot water will come out in seconds. Bath sinks always take forever to spit out hot water since they are low flow and usually have to dispense the water in a 3/4" trunk line to the bathroom. Tapping into 1/2" copper. Wish that was an easy option, but unfortunately the hw heater is in a storage room attached to the house by a carport. 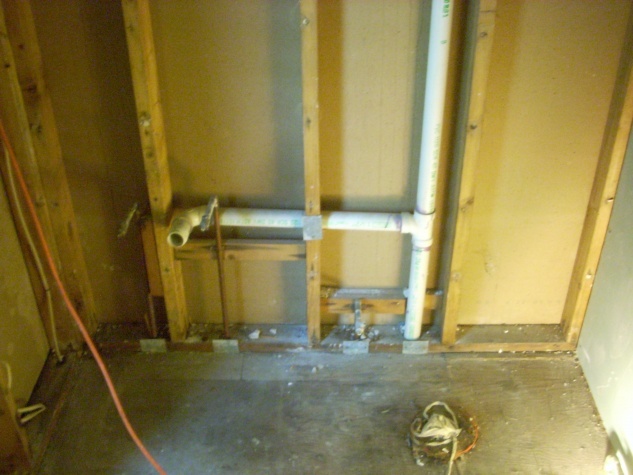 The supply lines run under the carport slab, then come back up into the crawlspace. Talk me out of this ladder. Guy at work says they are fairly heavy to move around, I am more into the sale price and adaptability for different situations, plus I wont need multiples. Looks like it only weighs 40lbs though. Going full potato on this home automation. Now I'm just playing around and learning about stuff so that next place will be legit. Added SmartThings hub and front door lock. I do not like it. It's too heavy for what it does, it's also a pain to extend to max length. 17ft is not very high. I'd rather have a normal extension ladder. The thing its good for is working over a staircase as you can make one side short and one side long. Other than that, it looks more handy than it is. OK, didn't realize until after that a normal ladder is about 22lbs. Going to take a look in the store this week and see whats up. Just purchased 42 four foot t8 LED bulbs for my garage. Garage is roughly 25'x40'. I literally have the worst garage lighting ever. However, that is about to change. I need to get on that. Will need sunglasses doe. @skelly how much you pay per bulb? What wattage are teh bulb? lumens? I paid 9.75 per bulb. I went with the recommendations of a dude on garage journal. See at The Best Light Fixture Ever! - The Garage Journal Board. First post. I referred someone at work at got $1,500 this month so i said *** it and got my garage redo moving. Cant insulate the attic until I install lighting. Cant put down epoxy flooring down until I can see what the *** I'm doing. Eh, depends what you're current stuff is. In the grow lamp fixtures I use I have four 54 watt High Output T5 bulbs in each one and they're INSANELY bright. They'd easily outshine any T8 bulb out there. And they're pretty damn cheap too. You can get a pack of 15 for about $80 at Home Depot. This is where I am at with other things as well, might as well wait until the price drops or the bulbs go out. But do they start at below zero? Not sure. They fire up in the mid to low 20s. what people are saying is that they emit too much light from a single source. Which is uncomfortable on the eyes. It's better to disperse the light with more and less powerful light fixtures.